Nautilus R616 Recumbent Bike Review - Eat. Move. Hack. Although some may think comfort and exercise don’t go together, having the right comfort level during a challenging workout can help guarantee you’ll make it through to the end. The advanced features of the Nautilus r616 recumbent bike are exactly what many people need in order to stay motivated for achieving their fitness goals. While the price tag of this machine sets it out of the range of some people’s budgets, the great features of this recumbent bike offers qualifies it as an excellent value. What remains to be seen is whether it lives up to its promise. Nautilus is a trusted brand for exercise equipment. This company also makes Schwinn products, which often are either comparable or less expensive than Nautilus machines. In fact, the Schwinn 270 recumbent bike falls within the same category of the Nautilus r616 in terms of features, but only the r616 comes with bluetooth connectivity. This is just one of the aspects that justifies its higher price. Is the r616 worth the one thousand dollars investment? A lot of its users have come to the conclusion that the answer is yes. As this is one of the remarkable features that set this stationary recumbent bike apart, it’s a great place to start. Bluetooth is a very attractive feature for exercise machines, and it’s growing in popularity, but it’s still only found in the premium models. The advantage of bluetooth is the ability to connect your wireless headphones to the machine and immerse yourself deeper into the workout. With wireless bluetooth headphones you won’t have to worry about getting tangled up in the cords as you exercise. Instead, you’ll get to enjoy listening to all the sounds and feedback from your program and compatible apps without having it be heard by those who may be nearby. Does the idea of enjoying virtual reality while exercising excite you? The Nautilus r616 syncs with both the Nautilus Trainer 2 and RideSocial fitness apps. With RideSocial, as the name suggests, you get to ride alongside others virtually as you visit different locations around the globe. It’s a great way to tour the world without ever leaving home. You can use RideSocial in addition to the Nautilus Trainer 2 app, which allows you to use your mobile device to view and keep track of your fitness stats. The Nautilus r616 recumbent bike comes with a generous 29 programs, which is about how many you’d expect from a top-of-the-line aerobics machine. The list of preset workout programs includes two fitness tests, one quick start program, one recovery test, four custom programs, and nine heart rate control programs in addition to the 12 profile programs. Some may find dual display to be a very important feature for machines of this type. Having that additional screen of data can mean not having to flip through displays while working out. Instead, all of your mission-critical stats stay right in front of you. It makes for a much smoother workout. The r616’s dual display is backlit in an engaging blue and can show up to 13 different workout stats all at once. With the 25 levels of resistance featured in this bike, finding a good range for your strength is a simple matter. This is in keeping with the number of levels you would expect a premium stationary bike to have. It means this machine is better equipped to accommodate you as your fitness grows. If you’re a beginner or just need something light, the lower levels should be sufficiently easy, but if you’re more advanced you’ll find that that this Nautilus can meet your needs as well. With this machine you don’t have to confine yourself to using only hand sensor or only a chest strap, as it has both. Some people already have a preference for one or the other, as chest straps require dealing with wires and hand sensors require you to grasp them while working out. The fact that this machine offers both grips as well as chest strap compatibility is great for those who aren’t experienced enough to know which to prefer. It caters to those who want the freedom to switch back and forth as the occasion dicates. While even some premium stationary bikes don’t give you this option, the fact that the r616 does says a lot about its quality and value. You can expect a smooth ride with this Nautilus recumbent bike. The high speed drive system, including a perimeter-weighted flywheel makes it so. The result is a consistent workout that’s easy to start and won’t be interrupted by undue difficulty. Users find this to be a very well-built recumbent bike. It’s sturdy and rides smoothly even at higher resistance levels and speed. Although the pedals are more than adequate, some have even found that they can switch them out for custom pedals, as it has the 9/16 pedal threads required. Assembling the Nautilus r616 is a simple process that most find comparatively easy. It’s a quiet, high quality exercise machine that gives users a professional gym experience right in their own homes. The r616 clearly has its raving fans, but there are a few downsides worth noting. For example, Some have reported that setting up the controls to display the right information can get a little complex. The user guide lacks the clear, detailed instructions necessary to make this part of the setup easy. Also, the type of chest strap recommended in the user guide proves hard to find. It calls for one that is uncoded. This premium recumbent bike from Nautilus is highly recommended for those who want all the features you would expect to find on a machine at the gym. It gives a quality performance even for those who are close to its 300 lb. weight capacity. Making good use of the compatible technology, like the RunSocial app allows users to take their sessions to a whole new level of experience. 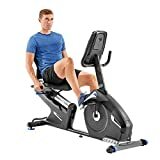 Indeed, the great amenities combined with the comfort of the seat and sturdiness of the frame can get users so engaged with their workout that the time seems to fly on by. For many, the Nautilus r616 recumbent bike provides almost everything a user could want from this type of machine.